Dr Diego Altamirano from the University of Southampton has contributed to new research that has proved the existence of a ‘gravitational vortex’ around a black hole. The discovery, published in the journal Monthly Notices of the Royal Astronomical Society, solves a mystery that has eluded astronomers for more than 30 years and will allow them to map the behaviour of matter very close to black holes. It could also open the door to future investigations of Albert Einstein's theory of general relativity. Matter falling into a black hole heats up and radiates back into space as X-rays. In the 1980s, astronomers discovered that the X-rays coming from black holes flicker, a phenomenon called Quasi Periodic Oscillation (QPO). QPOs are associated with a gravitational effect predicted by Einstein's general relativity: that a spinning object will create a kind of gravitational vortex. 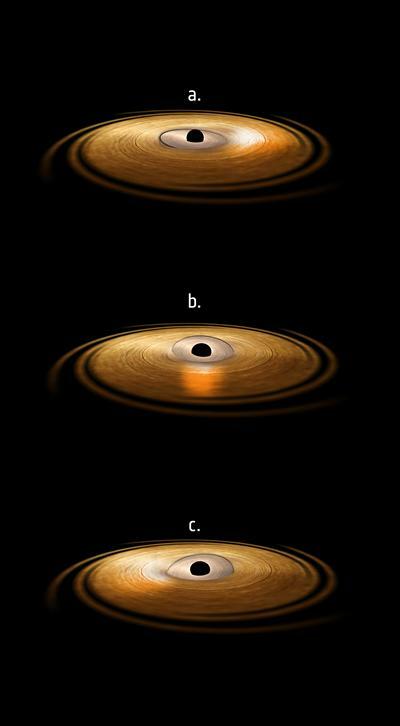 Together with colleagues, Ingram published a paper in 2009 suggesting that the QPO is driven by this Lense-Thirring effect, when the flat disc of matter surrounding a black hole, known as an ‘accretion disc’ spirals inwards towards the black hole. Close to the black hole, the accretion disc puffs up into a hot plasma, termed the hot inner flow, which shrinks as it is eaten by the black hole. The inner flow releases high energy radiation that strikes the matter in the surrounding accretion disc, making the iron atoms in the disc shine like a fluorescent light tube. Instead of visible light, the iron releases X-rays of almost a single wavelength - referred to as ‘a line’. Because the accretion disc is rotating, the line will sometimes shine on the approaching disc material and sometimes on the receding material, making the line wobble back and forth. Using ESA’s orbiting X-ray observatory, XMM-Newton, along with NASA's NuSTAR X-ray observatory, Dr Altamirano and colleagues from Amsterdam, Cambridge, Durham and Tokyo watched the QPO of black hole H 1743-322. The technique will allow astronomers to map matter in the inner regions of accretion discs around black holes. 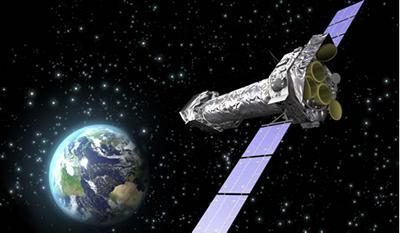 It also hints at a powerful new tool with which to test general relativity. “This is a major breakthrough since the study combines information about the timing and energy of X-ray photons to settle the 30-year debate around the origin of QPOs. The photon collecting capability of XMM-Newton was instrumental in this work,” says Norbert Schartel, ESA Project Scientist for XMM-Newton.